A customer had an unusual requirement. Their spine switches didn't have any out of band management connectivity and they were not yet going to run any IP protocols so we couldn't use a loopback and reditribute that into an IGP. Their spine switches were also utilizing MC-LAG. The problem was how to access the switches to manage them. We basically setup in-band ip addresses on the MC-LAG. These addresses would have to be reachable through static routes. The problem we encountered was, in an MC-LAG which member would be received as the owner of the ip address. There is an option called status-control which does this. I ran a test and found out that it seems to work opposite of what our expected behavior. First EX1's status-control is set to standby and EX2 is active. 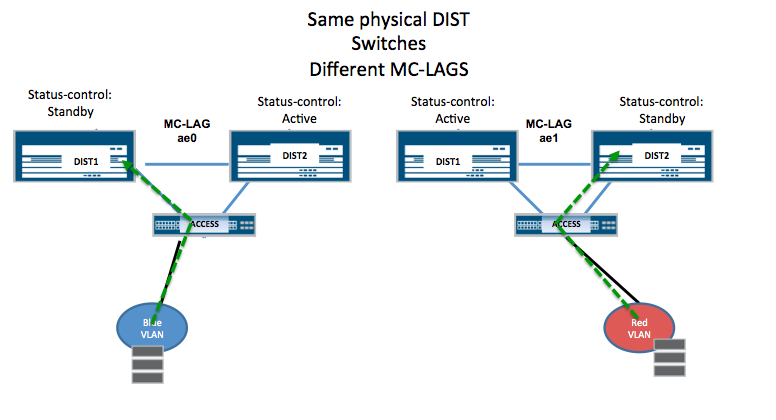 I put IRBs on both the MC-LAG Spine switches and the QFX leaf on vlan-id 100. 100.1.1.1 is the MC-LAG's ip and 100.1.1.100 is the QFX just for this test. From the QFX I try to access the Spine. Weird. Not sure why this behavior seems backwards. So the next issue is how do you access the other MC-LAG member? There are two ways. You can either access it via the ip address that is using the iccp connection. Or if you have the resources you can basically have two MC-LAGs per Spine switch and make one of them standby on one IRB and the other standby on a different IRB say 101 so both Chassises are IP reachable for management.